Swaying just by the river within a beautifully restored historical building lies a music enclave amongst calm waters and peaceful streams. Timbre continues to create waves with added flavours to its a la carte menu of Singapore talents within its new cosy and comfortable ambience. Enjoy a wide range of pizzas, tapas, salads & desserts on comfortable sofas while enjoying live music performances on a specially designed Timbre stage in front of the scenic backdrop of lights of Boat Quay and the Singapore River. Contemplate on its timeless beauty. Situated at the beautifully restored Old Parliament House, Timbre is also next to the historical landing site of our nation's founder, Sir Thomas Stamford Raffles. 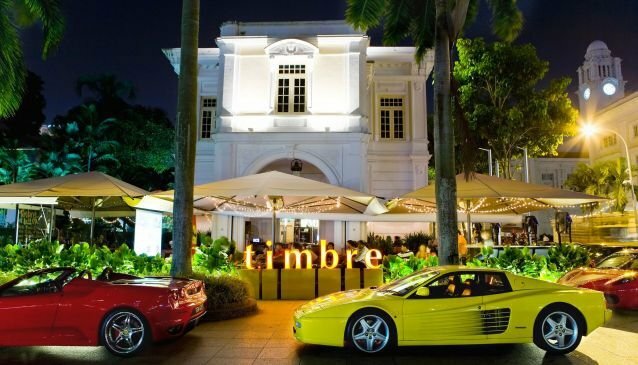 Timbre has other great company surrounded by important buildings of arts and history such as the Asian Civilisations Museum (ACM) and Victoria Concert Hall with parking available at the public car park nearby or at the New Parliament House car park. Convenient valet services are available too.